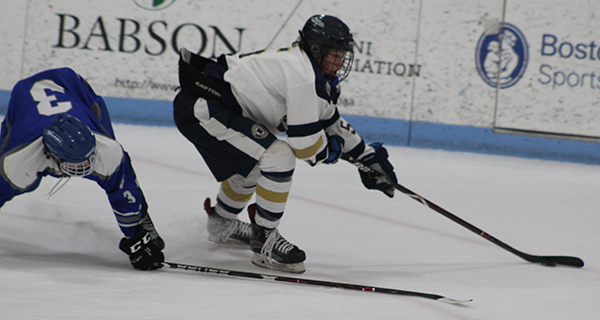 Senior forward Matt Pelletier (14) moves the puck through the neutral zone. Senior defenseman Brad Sprogis (22) ties up his man in front of the net. The Needham High varsity boys hockey team entered its matchup against Braintree at Babson Skating Center on Saturday night winners of three straight, and only needing two more wins to clinch a spot in the MIAA Division I State Tournament. Unfortunately for the Rockets (8-3-0, 4-1-0), it was one of those nights. 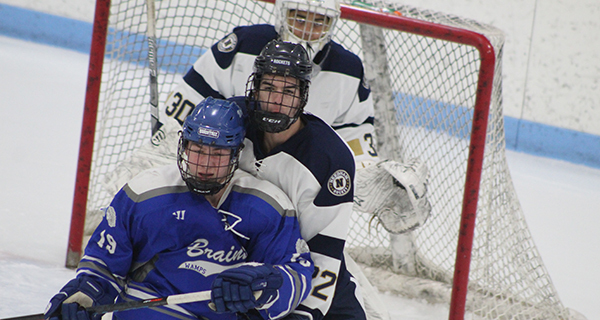 Needham could not get a puck to bounce their way despite some tremendous scoring opportunities, including a late breakaway bid for Dylan Demayo that was padded aside by Braintree goalie Dylan Anderson. Braintree, meanwhile, caught a pair of late breaks. The first came with 9:09 remaining when Matt Hemmert put home a rebound of a shot from the slot by Jason Curley to give the Wamps a 1-0 lead. The second break Braintree caught came on the power-play a little over two minutes later via a point shot deflection to double their lead to 2-0 with 7:04 to play. Senior captain and forward Tom Chmielewski utilizes his size and powers his away to the net for a scoring opportunity. Despite their hard work, the results just never came for Needham on Saturday night as Braintree came away victorious with the 2-0 victory. Needham freshman goaltender Oliver Lamadieu finished the game with 21 saves. Needham will look to get back on a winning note when the Rockets host rival Walpole on January 26 at Babson. For funny and incisive sports analysis, follow Mike Flanagan on his personal Twitter at @fLAno0.